Megan Mosholder, born in Columbus, Ohio, is a conceptual artist that operates in the real-world setting of the social-political landscape through site-responsive, sculptural installations. She is a recent graduate from the Savannah College of Art and Design where she developed her thesis body of work, A Tale of Two Bridges (2012), an exhibition that explored old conversations about city planning, race and power, older histories, and the more current social and political climate in Savannah, GA. Her exhibition history includes an installation in Lacoste, France, a body of work that speaks of the lasting impression a place of beauty can leave on an individual. She has authored five successful grant applications, including one from the Foundation for Contemporary Arts and her work has been published multiple times internationally in magazines such as the Huffington Post and Hi-Fructose. Presently, Megan is attending multiple artist residencies including a fellowship at The Wassaic Project and the Vermont Studio Center where she has been developing a new body of work for an upcoming show in February, 2014. My practice is centered on site-responsive, sculptural installations that emphasize obscured elements within recognizable objects. I articulate space and present a multi-sensory experience using simple materials such as light, twine, eyelets and wood. These “three-dimensional drawings” bind the social and literal landscape and reawaken for a moment the simple intrigue of looking. They are a visual dialogue about movement, time and dimension and encourage the viewer to appreciate spaces for what they are but also examine their hidden meanings. I found this project to be extremely difficult. The image I received was so dark and dismal. I asked others what they thought of it as a way to understand my own interpretation: one said it reminded them of the Holocaust. Another said it looked like smoldering trees. I’m not sure if I was able to decipher a message (the end of the world? Solitude and isolation? Destruction of the planet?) Honestly, the painting sent to me left me feeling uninspired. As a result, I really struggled to create a successful composition. I built the piece several times in different locations before I got something that I felt was remotely successful and even then I felt unsure about the final work. It forced me to think about how to solve the problem. Normally, I am drawn to a space that I want to work in and that is where the installation develops. Trying to convey a particular message based on another artist’s work was uncomfortable. I sent one of my images to an artist friend and he agreed that I was not succeeding and that it felt like I was trying too hard to transform my way of working to conform to the painting rather than literally transforming the space in which I was working. Deciding he was right, I scraped the image and went out in search of a new space to work within. 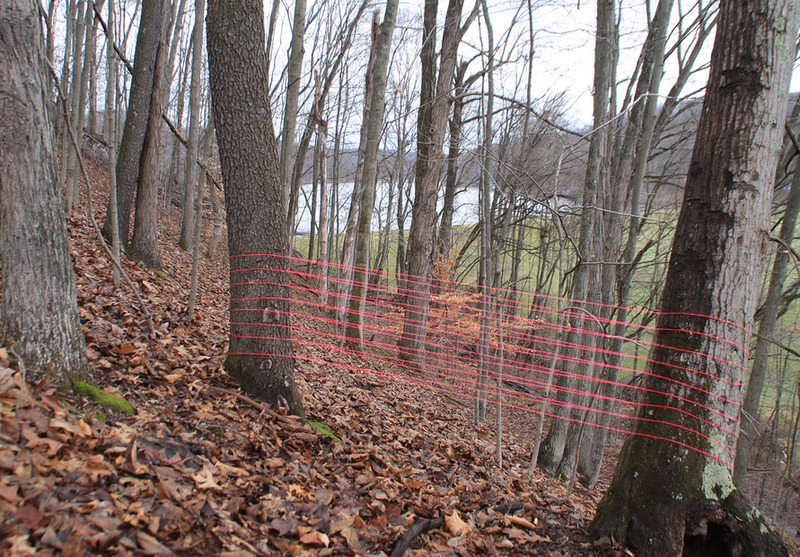 I am submitting three of the four installations I created in response to the Wood painting. 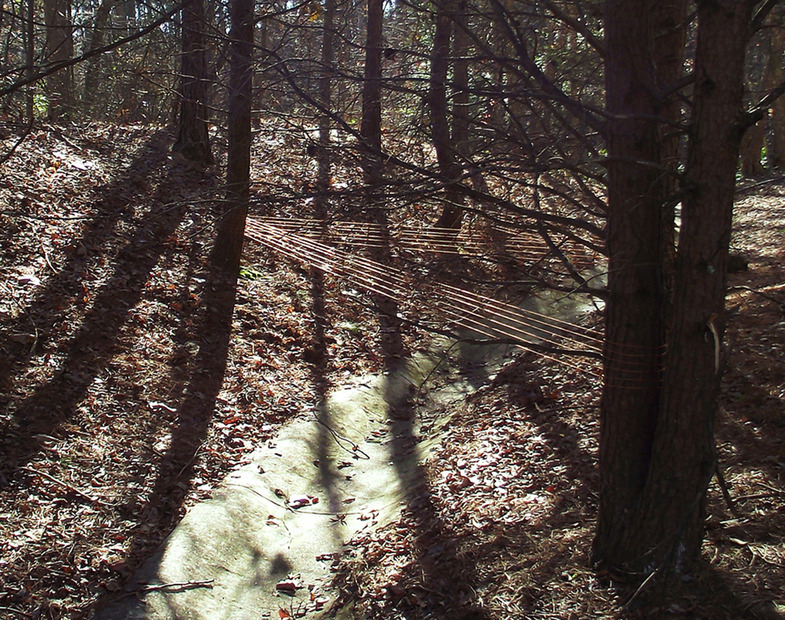 “Run Off” was the first piece I made and depicts orange twine installed between trees and over a concrete drainage ditch. I felt that this location conveyed the juxtaposition of the manmade versus the natural, which could translate to the end of the world element that the Wood painting presents. The second piece “Writing on Water” captures the atmospheric components of the Wood painting. 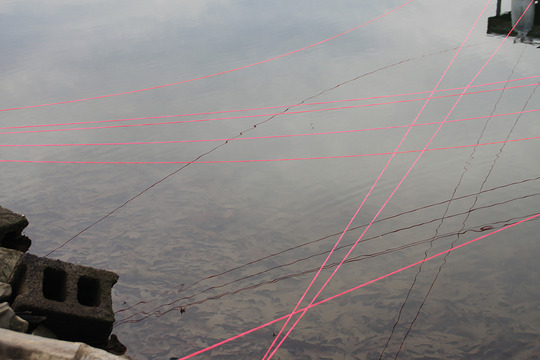 I entitled the final install “Periphery”, the pink twine blocking the viewer from moving through the picture plane. My final assessment of the project: it was a good but difficult challenge, one that I refused to give up on. I am submitting all three images with the intention of letting the Satellite Collective choose the most successful image.